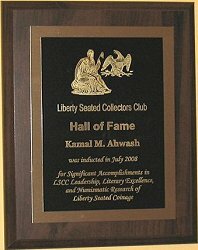 The LSCC Hall of Fame recognizes club members who have made significant contributions to expanding the literature on Seated coinage, who have built an important collection of Liberty Seated coinage or who have served in a leadership position while contributing to the success of LSCC. Individuals will be selected for this honor by a committee of five club members appointed by the club officers. The committee selections are announced during the club meeting at the ANA Summer Convention. Individuals selected for this honor will receive a plaque recognizing their admission to the Hall of Fame and a citation describing their contributions will be published in the Gobrecht Journal. During 2018, the Hall of Fame selection committee with members Len Augsburger, Gerry Fortin, Mark Sheldon, Tom DeLorey received nominations from the membership and unanimously approved an inductee into the LSCC Hall of Fame. To be nominated, potential inductees must have been a member of the LSCC for at least 10 years and made worthy contributions in Liberty Seated coinage numismatic research or numismatic literature, built a significant reference collection of Liberty Seated coinage, and/or served as a club officer for at least 5 years. During 2017, the Hall of Fame selection committee with members Len Augsburger, Gerry Fortin, Mark Sheldon, Tom DeLorey received nominations from the membership and unanimously approved an inductee into the LSCC Hall of Fame. To be nominated, potential inductees must have been a member of the LSCC for at least 10 years and made worthy contributions in Liberty Seated coinage numismatic research or numismatic literature, built a significant reference collection of Liberty Seated coinage, and/or served as a club officer for at least 5 years. Volume V - Philadelphia Mint (1839-1852). He has authored numerous numismatic research articles and served as a speaker at many local and national numismatic events. Bill presented at the American Numismatic Society's "Coinage of the Americas" Conference in 1986. He won the following major awards: The Liberty Seated Collectors Club’s James B. Pryor Numismatic Research Award for the best research article to appear in the first 50 issues of the Gobrecht Journal, the LSCC’s 2008 Kamal M. Ahwash Award for the best article to appear in the Gobrecht Journal, the John Reich Collectors Society’s 2008 award for the best article to appear in the John Reich Journal, the Numismatic Bibliomania Society’s 2008 Jack Collin's award for the best article by a new author in The Asylum, and the Extraordinary Merit awards from the Numismatic Literary Guild in 2011 and 2014. . He is a life member of ANA and a member of LSCC, NLG, JRCS, EAC, NBS, BCCS, and the Rittenhouse Society. Bill is Past-Vice President of the Liberty Seated Collectors Club, edits and publishes the LSCC's monthly electronic newsletter (The E-Gobrecht) since 2005 and is the editor and publisher of the LSCC’s printed publication (The Gobrecht Journal) since 2014. Bill gave 23 years service in the U.S. Army Signal Corps with assignments including 82nd Airborne Division, 1st Infantry Division, Special Operations Command, and Intelligence Support Activity. Bill also spent 10 years with TASC, Inc (a Northrup Grumman Company) as a Program Manager for Information Systems Security and Department Manager for Reconnaissance Satellite Systems Engineering. He lives in historic Gettysburg with his wife of 39 years, Judy, and five cats. During 2015, the Hall of Fame selection committee chaired by Bill Bugert with members Len Augsburger, Gerry Fortin, Mark Sheldon, Tom DeLorey received nominations from the membership and unanimously approved an inductee into the LSCC Hall of Fame. To be nominated, potential inductees must have been a member of the LSCC for at least 10 years and made worthy contributions in Liberty Seated coinage numismatic research or numismatic literature, built a significant reference collection of Liberty Seated coinage, and/or served as a club officer for at least 5 years. On August 13 at the 2015 annual meeting of the Liberty Seated Collectors Club in Rosement, Illinois, Jim Gray was inducted into the LSCC Hall of Fame. Once again during 2104, the Hall of Fame selection committee chaired by Bill Bugert with members Len Augsburger, Gerry Fortin, Mark Sheldon, Tom DeLorey received nominations from the membership and unanimously approved an inductee into the LSCC Hall of Fame. To be nominated, potential inductees must have been a member of the LSCC for at least 10 years and made worthy contributions in Liberty Seated coinage numismatic research or numismatic literature, built a significant reference collection of Liberty Seated coinage, and/or served as a club officer for at least 5 years. On August 15 at the 2014 annual meeting of the Liberty Seated Collectors Club in Rosement, Illinois, Eugene H. Gardner was inducted into the LSCC Hall of Fame. Eugene Gardner kindly shared the following numismatic biography after receiving the Hall of Fame award. I formed my first collection (1955-1965) while I was still in college in Boston, mainly under the supervision of Malcolm Chell-Frost, but also through dealings with New York dealers New Netherlands (John Ford, Charles Wormser), and Stacks (Ben and Norman). I was not terribly focused on any particular series but stressed only 19th century (1793-1915) coins with the primary interest being color and strength of strike. (I was a stickler for full breast feathers on the eagle on the reverse). Major pieces which have since resurfaced included an 1804 quarter in MS-65, an 1857 proof penny in PF-65 red; and one which has not shown up yet the finest 1872-CC dime I have ever seen. It was not graded back then. But as I remember it I have to say it would be a shot 65.The collection was sold by Stacks in 1966 as I had started a family and needed to raise money to buy a house, car and everything else that went with starting a household. As I remember it,the $1500 I paid for the 1804 quarter was the most I had ever paid for an individual coin ($1900 bought me a complete red uncirculated set of Lincoln cents 1909-1958 in MS-64, MS-65). I came back to collecting almost by chance in 1995, but it was not until the Eliasberg and Pittman sales in 1996-1998 that I really started to collect again. Sticker shock overwhelmed me at first, but I slowly adjusted to the current price structure. My emphasis on color and strike had not changed and my focus on 19th century coins was still intact. For the first few years I began to accumulate Liberty Seated coins almost by chance. But by 2001 my goal crystallised in to completing all Seated series from half dimes to dollars --in silver in both uncirculated and proof in the finest condition I could locate. By the end (2014) the collection lacked only three coins in uncirculated (1870-S half dime, 1873-CC no arrows dime, and 1853-O no arrows half), and one proof coin (1853 half dime). I haven't done a formal calculation but the average grade for the entire set should be well over 65, and possibly over 66. And grade alone does not do justice to the strong eye appeal which is the hallmark of these lustrous, beautifully toned coins. It is hard for me to pick out my favorite series among the half dimes, dimes, quarters and halves. I don't think the dimes and quarters can be bettered particularly if the proofs are included as part of a complete series. So many of those are unique or only two or three known (1841 no drapery dime, 1838 quarter among others), that the collection will be hard to replicate. But when today I think about the collection my attention always first returns to the half dollars from 1850-1852. Every coin was spectacular, led by the 1850 from the Eliasberg collection in MS-67, a proof-like gem. During 2013, the five member Hall of Fame selection committee chaired by Bill Bugert with members Len Augsburger, Gerry Fortin, Mark Sheldon, Tom DeLorey received nominations from the membership and unanimously approved two inductees into the LSCC Hall of Fame. To be nominated, potential inductees must have been a member of the LSCC for at least 10 years and made worthy contributions in Liberty Seated coinage numismatic research or numismatic literature, built a significant reference collection of Liberty Seated coinage, and/or served as a club officer for at least 5 years. On August 15 at the 2013 annual meeting of the Liberty Seated Collectors Club in Rosement, Illinois, Gerry Fortin and Jim O'Donnell were inducted into the LSCC Hall of Fame. Gerry Fortin has been a Liberty Seated Collectors Club member since 1990 and is well known for his Liberty Seated Dime online reference work entitled, The Definitive Resource for Liberty Seated Dime Variety Collectors. This pioneering approach to publishing Seated coinage variety information was launched during 2004 and is constantly updated with new variety and die state discoveries. Gerry also actively supports the Liberty Seated Collector Club as the Regional Meeting program manager and serves as the LSCCweb.org webmaster. In addition, Gerry writes frequency for the LSCC E-Gobrecht monthly magazine and has won two Kam Ahwash awards (2007 and 2010) for articles published in the Gobrecht Journal. As a passionate collector of Liberty Seated dimes, Gerry assembed the #1 Finest Seated Dime Business Strike with Varieties set in the PCGS Set Registry and has won seven consecutive Best Classic Set awards. In early 2013, Gerry retired from a 35 year career in the semiconductor industry and started Rare American Coins LLC, a numismatic sales business with a primary focus on providing customers with original and high quality Seated coinage. He frequents major coin shows in the eastern United States as a dealer and will occasionally display his Liberty Seated Dime set at regional shows to aid the LSCC with member recruitment. Jim O'Donnell was a life long bachelor and resident of New York City. He was well respected and extremely knowledgeable Liberty Seated coinage dealer and collector. Jim possessed an incredible memory for Liberty Seated rarities, their individual provenance and major auction events. This memory was also evident when visiting Jim's tables at major coin shows. None of his coins were ever marked with codes for purchase or selling prices but Jim could immediately quote you an asking price and relate the coin's history in terms of auction appearances or which other dealers might have handled the piece. Collecting condition census Liberty Seated dimes was one of Jim's passions and his personal inventory of mint state dimes was incredible. Typically, Jim would carry a few of his mint state Carson City Seated dimes in his pocket and pull them out for a lively session of show and tell with younger club members. Jim's life ended tragically during 2008 and he is sorely missed by many in the club who appreciated his mentorship on all Liberty Seated coinage series. Effective 2012, an updated five member selection committee chaired by Bill Bugert with members Len Augsburger, Gerry Fortin, Mark Sheldon, Tom DeLorey received nominations from the membership and unanimously approved their first inductee into the LSCC Hall of Fame. To be nominated, potential inductees must have been a member of the LSCC for at least 10 years and made worthy contributions in Liberty Seated coinage numismatic research or numismatic literature, built a significant reference collection of Liberty Seated coinage, and/or served as a club officer for at least 5 years. 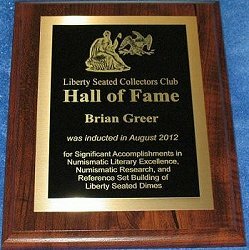 On August 9 at the 2012 annual meeting of the Liberty Seated Collectors Club in Philadelphia, Brian Greer was inducted into the LSCC Hall of Fame. Brian Greer is well known for authoring "The Complete Guide to Liberty Seated Dimes" (1992) by DLRC Press. Brian began collecting Seated Dimes in college after chosing the series because they were the least expensive denomination of Liberty Seated coins to collect. He did not plan on finishing the collection but was hooked after a short time. Mr. Greer became an LSCC member in 1981. Brian performed early research on Liberty Seated dime rarities by date, mintmark and die variety. He assembled a well known reference collection that became the source for images for the Seated Dime guidebook. After publishing the Seated Dime reference, Brian still enjoyed pursuing the Seated series however he began putting more energy into learning other series, notably Bust coins. Greer sold the majority of his Seated Dime collection after 1992 and transitioned into buying and selling all denominations of Liberty Seated and Bust coinage. Today Brian studies Colonial coins more that any of the other Federal issues. He still would have a hard time picking favorites as enjoying all US series of coins. Brian is a frequent contributor to The Gobrecht Journal and can be seen a most major shows buying inventory for his web based numismatic sales. 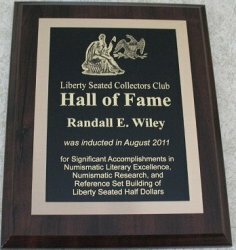 On August 18 at the 2011 annual meeting of the Liberty Seated Collectors Club, Randy Wiley was inducted into the LSCC Hall of Fame. Wiley was the co-author of "The Complete Guide to Liberty Seated Half Dollars" (1992) and assembled and still owns a massive high grade half dollar reference collection. Wiley is a frequent contributor to The Gobrecht Journal and continues to consult on Seated Half Dollar research and publishing projects. 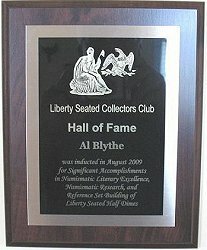 On August 6 at the 2009 annual meeting of the Liberty Seated Collectors Club, Al Blythe was inducted into the LSCC Hall of Fame. Blythe was the author of "The Complete Guide to Liberty Seated Half Dimes" (1992) and assembled a massive half dime reference collection which was sold by Heritage Auction Galleries in 2008. Blythe was a frequent contributor to The Gobrecht Journal and operated Sierra Vista Coins in Minden, Nevada for a number of years. Blythe passed away in 2007 at the age of 82, and was represented at the Hall of Fame ceremony by his daughters Gail Blythe Bruney and Cynthe Blythe Renfrew. On July 31, 2008 at the 2008 annual meeting of the Liberty Seated Collectors Club, two prominent club members were inducted into its newly formed Hall of Fame. Established in 2007 to recognize and formally remember individual contributions, John W. McCloskey and Kamal M. Ahwash, on the 25th anniversary of his death, are the first two to be inducted. A five member selection committee (chaired by Jim Gray with members Len Augsburger, Mark Sheldon, Tom DeLorey, and Bill Bugert) received nominations from the membership and unanimously approved these inductees into the LSCC Hall of Fame. To be nominated, potential inductees must have been a member of the LSCC for at least 10 years and made worthy contributions in Liberty Seated coinage numismatic research or numismatic literature, built a significant reference collection of Liberty Seated coinage, and/or served as a club officer for at least 5 years. 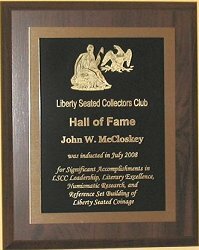 John McCloskey was inducted into the Hall of Fame for his “Significant accomplishments in LSCC leadership, literary excellence, numismatic research and reference set building of Liberty Seated Coinage.” John is a founding member of the LSCC and has been the LSCC President since 1975. He is and has been the editor of the Club’s printed publication, The Gobrecht Journal, since 1975. John has written over 200 articles for The Gobrecht Journal and was a principal presenter at the 1986 and 1989 American Numismatic Society’s Coinage of America’s Conferences. He has extensive reference collections of all the Liberty Seated coin series. He unselfishly devotes many hours to mentoring other collectors and is directly responsible for advancing interest in the Liberty Seated coin series as well as growing the LSCC membership from a few dozen to over 600. John and his wife, Norma, accepted a plaque at the LSCC meeting and awards ceremony. Kamal M. Ahwash, also a founder of the LSCC, was inducted into the Hall of Fame for his “Significant accomplishments in LSCC leadership, literary excellence, and numismatic research of Liberty Seated coinage.” Kam began dealing in Liberty Seated coinage in the mid-1960’s and is generally considered to be the founder of Liberty Seated coinage research. In the 1960’s, he quickly became the nationally recognized expert of Liberty Seated coins and was a consultant to the American Numismatic Association’s certification service. In 1977, he authored the Encyclopedia of United States Liberty Seated Dimes which became the standard reference for the series for many years. Tragically, he died in 1983 at the age of 59 years. His daughter, Michele Ahwash, accepted his plaque at LSCC meeting and award ceremony.